Natural Power, also called Eco Power, Green Power or Clean Power, is electricity produced by 100% renewable energies (Solar, Wind, Water, Biomass, Geothermal). The term Natural Power is derived from the German term Naturstrom. Please order a Natural Power product from your electricity supplier, which contains a proportion of solar power, or change your electricity supplier (see Nuclear more expensive than Natural Power - Change the supplier, 17.1.2013). In Switzerland the electricity demand cannot be supplied with water power alone and the largest build-up potential is in solar energy. With your order of Natural Power your electricity supplier must feed the quality of electricity ordered (e.g. proportion of solar energy) in the quantity used by yourself into the public grid. Tüv-guaranteed! In Switzerland «naturemade» is the quality mark for ecologically produced energy (naturemade star) and energy from renewable sources (naturemade basic). The mark is awarded after thorough inspection by the Association for environmentally sound energy (VUE). Below are some links (ADEV and Elektrizitätswerke) for certified Natural Power products in Switzerland. This simple decision triggers directly the necessary investments and extends thereby today's Natural Power offers and supply. The list below shows examples of Natural Power suppliers in some countries. The change to Natural Power is a simple, economic and effective decision. The change to Natural Power is the only solution to the highly risky «Climate Change by Radioactivity» and an important basis for a future-qualified, peaceful world. 15% aller Schweizer Haushalte beziehen Naturstrom. Der Verkauf hat 2007 um 63 % zugenommen. Beachten Sie die Stromkennzeichnung. 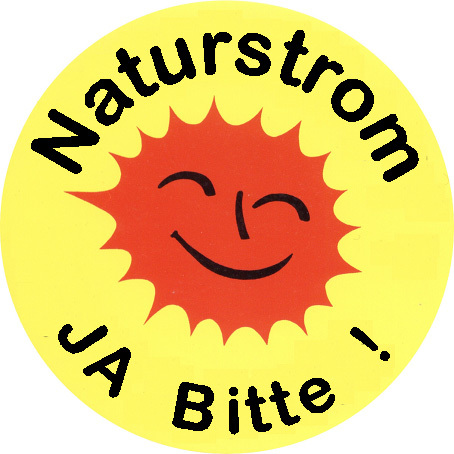 Anbieter, die 100% Naturstrom/Ökostrom liefern, werden mit einen vollständig grünen Balken dargestellt. Der Tarifkalkulator ist ein Service des Energiemarktregulators E-Control GmbH. Natural Power - Yes Please !